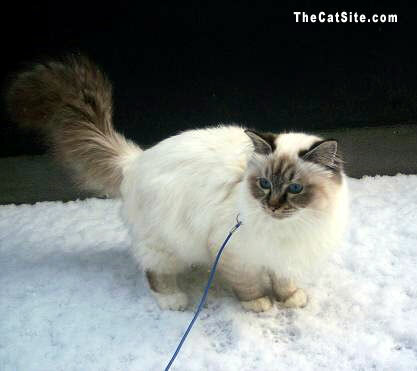 I recall the first time I noticed a cat being walked on a leash outdoors. Smiles all around, at seeing our neighbor with a leash at hand, and where you might expect a large fearsome canine: a busy little cat. The leash is where the resemblance to walking a dog ended. Actually, you can never really "walk a cat"; you walk alongside it, letting it explore the environment at its own feline pace. So, why dress Kitty up in a harness and get it outside to begin with? Should you even try to leash train your cat? Let's take a look at some of the pros and cons, and then try to explain how to achieve this rather extraordinary feat. Should I Leash Train My Cat? Some cat experts argue that it's wise to leash train every cat, even if you plan on your cat never setting a foot outside. Their reason is this: whenever you have to take your cat outside your home, traveling or even on a visit to the vet, it is safer to have the cat wearing a harness and a leash. Any amount of time spent outside the carrier, brief as it may be, is made safer if you have your hand securely around a leash, attached to the cat's harness. Of course, with most cat owners, the main motivation for leash training a cat is to be able to provide it with controlled, restricted and hence safe, access to the great outdoors. The sights, sounds and smells, and the new tactile stimulation of walking on grass, earth or even snow, can indeed provide a cat with an enriching adventure. What's more, frequent walks near your home may help familiarize your cat with the surrounding area. In case your cat ever gets outside by mistake, she may be less prone to panic and more likely to stick around and even find her way back home. Having mentioned the advantages, it's time to point out the possible shortcomings of letting your cat outside even when harnessed and leashed. First, some cats are simply too intimidated by being outdoors. Growing up indoors only seems to bring about a feline version of agoraphobia in some cats, where being outdoors could be too traumatic for them. Strange cats around your home could increase the sense of fear, as your cat can sense their scents even when no cat is in sight. Furthermore, depending on when and where you choose to go out, you could be exposing your cat to parasites, such as fleas, ticks and even infectious diseases carried around from outside cats. Ingestion of foreign substances or foods is less likely, but not impossible. In fact, one forum member on TheCatSite.com told us that her cat managed to hunt a mouse in the tall grass while walking next to her, on a harness and leash. 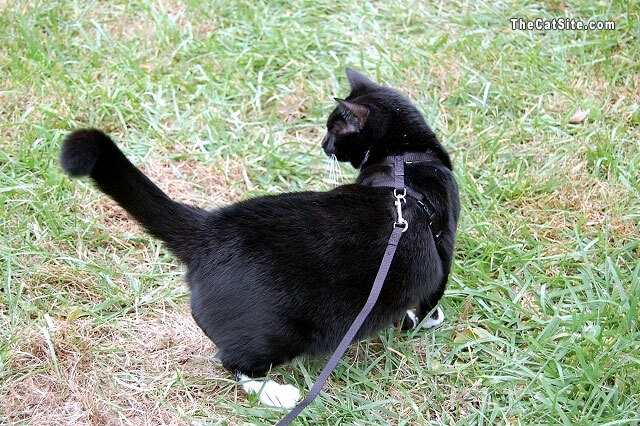 So, should you leash train your cat and get it outdoors? Training your cat to wear a harness and leash seems to be a good move. As for going outside, you should weigh the pros and cons as they relate to the specific cat, its temperament and your surroundings. Your cat may be wearing a collar, yet you should never use that as an anchoring point for a leash. Cat collars are not called breakaway collars for nothing. When tugged and pulled, they are expected to either break open, or allow your cat to wriggle its head out of them. Not something that you want happening outdoors. The names relate to the harness design, where the "8" type is the more basic harness, made of two loops that go around the cat's neck and torso respectively, attached at the back of the neck. The "H" type harness connects the two loops with an additional piece, to which the leash connects, creating the letter H when facing sideways. Many cat owners seem to prefer the H shaped harness, as it seems to create less pressure on the cat's neck. You could try both and see which one is easier for you to use and easier for your cat to adapt to. Others prefer the holster type, saying this type seems to be far more secure and comfortable for the cats than either the "H" or "8" types. As for the leash, a relatively short and very lightweight leash is all you need. So, you've decided you want to harness and leash train your cat, and you have the gear ready, now what? Well, get plenty of cat treats and gather up your patience. Before you start, keep in mind that not every cat can be trained to walk with a leash and harness, so give it a try, but work with your cat and respect her needs. The principle of harness training is relatively simple. You want to gradually de-sensitize your cat to the touch and feel of the harness. First, just put the harness on your cat and try to distract her with a treat or a favorite toy. If you can, buckle up the harness, but if there is any sign of resistance, don't use force, just leave the harness on, and quickly distract your cat with a treat. Your aim is to get the cat used to wearing the harness, all buckled up, for at least fifteen minutes a day. You must always keep calm and casual about it, and never ever use force or get upset with the cat. Bribery is allowed and even recommended, in this case, so keep a supply of your cat's favorite treats and toys it hand. With time, your cat my actually begin to associate the wearing of the harness with the fun time of treats and toys, so she or he may even welcome "harness hour". Once the cat seems relaxed while wearing the harness, it's time to attach the leash. You are still indoors, so no need to even hold the leash. Just let it drag behind gently (remember, it should be a lightweight one), and keep Kitty's mind on her treats. In the next phase, once your cat seems accustomed to the presence of the leash, it's time to pick up one end of the leash and follow Kitty around the house. Cat expert Pam Johnson-Bennett, author of Think Like a Cat: How to Raise a Well-Adjusted Cat--Not a Sour Puss offers an additional phase to the process. Once you get to the leash holding phase, while still safely indoors, take a step forward in front of your cat, and hold out a treat at eye level. As your cat sniffs and walks over, say out loud "Let's walk". Give her or him the prize and repeat, taking another step forward, holding out another treat (keep a stock in your pocket for this exercise) and again repeat the words "Let's walk" and provide the treat as your Kitty takes those steps following you. Repeat this several times until your cat becomes used to following you. Johnson-Bennett then recommends introducing very gentle tugs to the procedure, and practicing indoors for several weeks. Only when your cat is completely comfortable with walking on a harness and leash, you may attempt those first outdoors strolls. Keep walking routine close to home and in familiar surroundings. Your backyard is probably the best suited place for it. Make sure there are no unexpected dogs or foreign cats en route. Follow your cat as she or he explores the area, but stay alert. If you notice a potential problem or disturbance, calmly pick up the cat in your arms and walk back home. Pictures of cats in this article were kindly submitted by our forum members on TheCatSite.com forums. Read more of their experience in this thread.